A major collection of portrait photographs by the late John Hedgecoe, who restored Oxnead Hall, near Aylsham, has been given to the Sainsbury Centre, Norwich, by his family. In June 1966 he undertook a 20-minute shoot in the Queen’s Gallery at Buckingham Palace – depicting the monarch in profile in the 14th year of her reign. The Queen selected her preferred picture and the sculptor Arnold Machin made a plaster bust, which Hedgecoe then snapped for the postage stamps in use to this day. Thanks to those 45 years of mass production the royal portrait is believed to be the most frequently reproduced image – of anyone or anything – in the world. We know the stamps as 'Machins' but if the photographer's involvement had been more widely known, maybe we would be referring to them as 'Hedgecoes'? After all they followed the series which uses photographs by Dorothy Wilding! The Face of the Artist: Photographs by John Hedgecoe can be seen at the Sainsbury Centre for Visual Arts (telephone 01603 593199; website www.scva.ac.uk) from Tuesday until December 4. Wasn't there some sort of a contoversy over who actually too the final photograph of the cast? I remember reading somewhere that Machin talks about this being taken outside Harrisons on a misty morning with a Victorian box camera and the photographer with a black cloth over his head. I don't think he actually says it was Hedgecoe who took it. I gathered that this was a claim by Hedgecoe himself much later on, possibly peeved at not having a very large share in the glory. I think you'd have to check the history-sites for the detail. I think Hedgecoe eventually got Royal Mail to acknowledge that the stamp design was based on a photograph that he originally took. I don't think he took the photos of the cast, but I may be wrong. Hedgecoe sued Royal Mail and got them to admit in 2001 that his photographs were used in "the final study." Based on timelines in Machin's autobiography and Douglas Muir's well-researched book "A Timeless Classic," Machin was already far along in the design of the bust by the time Hedgecoe took his photographs. Machin started work in early 1966 using photographs taken by Lord Snowdon, plus his own materials from his personal sittings with the Queen during the design of the coinage portrait a few years earlier. Hedgecoe was commissioned to take photos when the post office was considering an alternative to Machin's sculpted image. In the end, Machin's design was kept, but Hedgecoe's photographs were used to change the Queen's headdress from a tiara (as used on the coinage portrait) to the now well-known diadem. That's what Royal Mail meant by "design of the final study." As for the photos of the cast, there was more than one final cast and more than one photo of each. The various versions of the Machin portrait (which we call Head A, Head B, etc.) were derived from different casts and different photos. There do not seem to be any records of who took the photos that were actually used in the development of the stamps. R's comment above is correct. The comments by Machin appeared in Gibbons Stamp Monthly, and the name of the photographer was not mentioned. However, this was perhaps only one of the several photos actually used to create stamps. I strongly recommend Muir's book to anyone interested in the history of the Machins. It is available from the BPMA at http://shop.postalheritage.org.uk. This comment in Wikipedia is clearly wrong as the stamps were issued in June 1967! 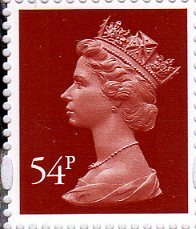 "Hedgecoe’s profile shot of the Queen was made by him in June 1967, and was then used by Arnold Machin (a well-known stamp sculpturer) to make a plaster version. Once the plaster version was produced, Hedgecoe then photographed it for the stamp image which is now familiar to many"
"(Her Majesty) chose 14 of his images, eventually whittled to just one which was then rendered in plaster relief by the artist and sculptor Arnold Machin." The two main versions of the story seem to be fairly evenly reported. I can assure you that Ian Norvic is correct and that my father John Hedgecoe took the Photograph of the Queen and the subsequent Photograph of the Plaster Relief by Arnold Machin which was used for the Stamps. The negatives, contact sheets and copies of the prints of the Queen and the Plaster Relief remain in the Hedgecoe family archive. Best regards Sebastian Hedgecoe.